Earlier this month, 411mania had the chance to check out an early gameplay demo for Hitman 2, the next installment for the Hitman game series, at Warner Bros. Interactive’s office in Burbank, California. Hitman 2 marks the seventh entry in the series, and it’s set after the events of the 2016 Hitman game, as Agent 47 is on a mission to eliminate the Shadow Client and take apart his militia. The new hands-on gameplay demo featured Agent 47 on an assassination mission to take out key members of a drug cartel in Colombia. 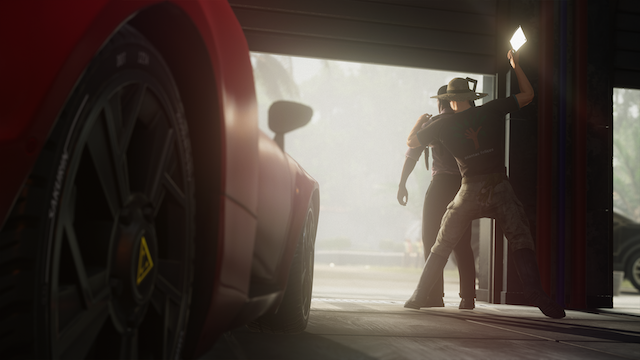 The E3 2018 demo featured an assassination quest at a race car track in Miami, Florida. So, this was a very unique setting for the mission, but still very exotic. The gameplay demo definitely favors players taking their time, exploration and observing their surroundings. It’s also a demo players have to really think out their actions for Agent 47. If Agent 47 starts acting suspicious or pokes around where he shouldn’t, he will tip off the guards or soldiers patrolling the area, or he will get the attention of non-playable characters. Once you figure out the correct path to take for the mission is when the gameplay really starts into place. One particular assassination mission for the Colombia map has Agent 47 knocking out a hipster working as a drug mule in the small town. Agent 47 then gets to wear a hippie disguise in order to go undercover for a drug deal to take out one of the cartel’s high-ranking members. There’s definitely some trial and error involved for the missions. For example, poisoning the drugs meant to hide in a broken toy requires getting glue to repair the toy. But then to get the glue, you have to go to the general store. However, the general store is out of glue, and you have to get the last remaining glue in the slum from a mechanic. The mechanic doesn’t want to give you the glue. Knocking out the mechanic is a problem since he’s out in full view, and his wife is constantly pacing around. So, if there’s one criticism, it seems just getting a simple item such as glue can be a bit of a chore. Getting the poison for the drugs was as simple as swiping a leap from a plan that was out in the open. Granted, once the trial and error process is finished and you have the right tricks down, the gameplay does become very satisfying. Plus, there are multiple approaches you can take. Agent 47 does have his gun and fiber wire available. However, taking out guards can be a very dangerous prospect and expose Agent 47 if he’s not careful. The most satisfying part of the mission was setting up an assassination of a drug cartel leader by luring him to a band at a statue unveiling ceremony and sabotaging the statue so it will drop on top of the drug dealer. Based on the Miami and Colombia maps, it’s really satisfying how IO Interactive has populated the game worlds. The maps are quite large, and they are filled with activity and fully populated with NPCs. The game world for Hitman 2 is strong on immersion. The AI for the NPCs looked to be fairly strong, so the game favors a deliberate and cautious approach to gathering intel. For example, when gathering intel at a hotel front desk, you might have to create a distraction outside to lure out the clerk. But then there’s a vacationer pacing in and out of the lobby on a cell phone you have to watch out for. Additionally, voice actor David Bateson’s performance as the stoic and terse Agent 47 is still on point. His responses to the drug dealers while in disguise as a hippy are especially amusing. It appears the disguises for Agent 47 will be one of the most fun aspects of the game. 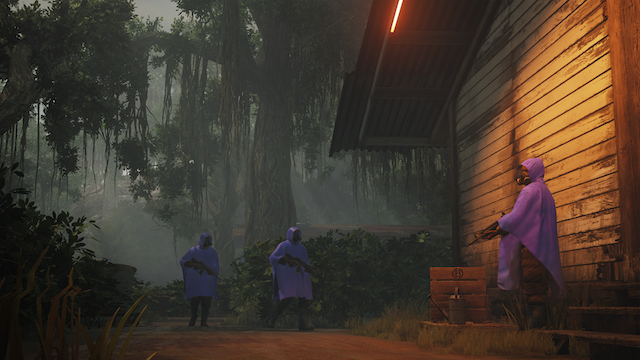 Hitman 2 arrives on November 13. The game will be available for PlayStation 4, PlayStation 4 Pro, the Xbox One, the Xbox One and Windows PC.